We recommend using a Tree Hugger Hammock Hanging Kit to hang your hammock from a tree. 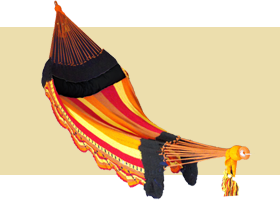 Click on the picture to learn more about the Tree Hugger Hammock Straps. If you don’t have the Tree Hugger kit, you can use the following knot to hang your hammock from a post or tree using standard rope. Note: You can also drill an eye screw into tree or post if you plan to make it a permanent hanging point. Wrap around tree 2 or 3 times without crisscrossing the rope. Leave 1-2 ft of loose rope on the left side. Wrap the free left end (working end) OVER and then around the right end (standing end) and pull through the loop. With the working end now on the right side, bring it UNDER then around standing end and pull through the loop. Repeat previous step once again. Pull knot tight to tree and congratulate yourself: That is how you hang a hammock from a tree! Follow directions provided with your Tree Hugger kit and use the provided 2 lengths of rope and the “Hammock Knot” and “Figure 8” knot to hang hammock.